The Government of Nakhchivan Autonomous Republic (Azerbaijan) has shown to the world a deep commitment towards strengthening its response to the threat of climate change, enhanced urban development, revamped sustainable tourism industry and promoted reforestation projects throughout the regions of Nakhchivan. The architects of the Paris Agreement and international community in general ought to pay a greater attention to the remarkable accomplishments that are taking place today in Nakhchivan, the westernmost province of Azerbaijan. Over the last decade, Chairman Vasif Talibov has radically transformed the renewable energy production matrix of Nakhchivan, a region that has the world’s highest number of hydroelectric power plants per square kilometer, making this territory of Azerbaijan home of seven hydroelectric dams, one solar power plant and one gas turbine. Furthermore, the city of Heydarabad, only a few meters away from the border with Armenia and a hundred yards away from a desolate, precarious Armenian village, is testimony to a perfect urban setting with paved roads, where a brand new middle school, health care center and a city hall make it an attractive tourist destination. Additionally, foreign visitors will appreciate a prosperous city with all amenities on the Azerbaijani side and on the Armenian side there is a poor community with houses built out of mud bricks; indeed it appears to be an abandoned village that is artificially implanted by Yerevan’s government. On November 23rd, 2017, as I was traveling from Nakhchivan city to Shahrur region, it is remarkable to observe the overwhelming reforestation campaigns organized by the local leadership, on both sides of a widely paved highway, a project that had involved civil society leaders, Nakhchivan State University students and faculty and members of the Azerbaijani Armed Forces. Chairman Vasif Talibov’s vision and dynamic leadership has encompassed another sector that is very important to Azerbaijan’s national economy, tourism infrastructure and restoration of historical, archaeological sites have proved to be vital in the promotion of the Autonomous Republic of Nakhchivan across the world. The Alinja – Gala Fortress is an emblematic monument that has attracted thousands of tourists and rushed forward as a symbol of Azerbaijan’s government will in restoring historical monuments and bolstering the tourism industry at a time when Autonomous Republic of Nakhchivan has been selected as the world’s capital city of Islamic culture. 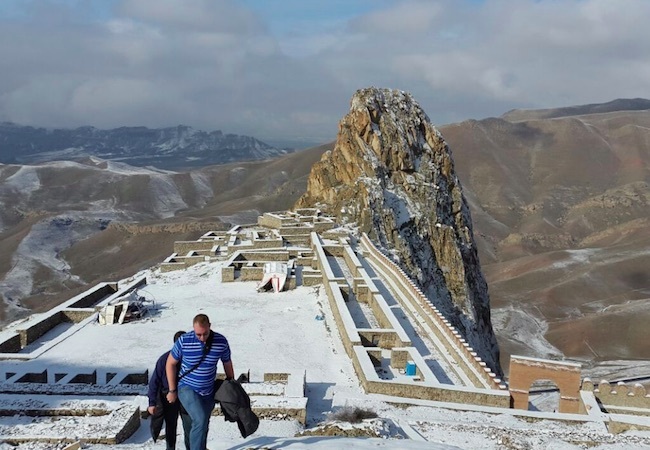 Merely located one hour away from Nakhchivan city, Alinja – Gala fortress, a masterpiece of Chairman Vasif Talibov’s vision, is a genuine tourist destination and a cultural monument that is equally a brilliant engineering innovation established at the top of a rock on the VI century. The fortifications crowning its defense system are at an altitude of 1,800 meters. Indeed, in Azerbaijan there are other fortresses built at a greater height but they cannot be compared to Alinja – Gala fortress. The combination of natural obstacles and the art of fortification, make this structure impossible to conquer by force. Up to fifty buildings have been located at the top: barracks, warehouses, and a prison for highly dangerous criminals, a bathhouse, stables, bakeries, a mint house, an extensive arsenal, the treasury and the ruler’s palace. Many leaders have deposited their treasures in this fortress; including the great Atabeys of Azerbaijan, the Ildenizids, the Khulaguids and the Jelairids. At that time it was hard to find a safer place than Alinja – Gala, the quantity of treasures deposited in Alinja-Gala can be ascertained from the fact that when a ruler from the Chobanid dynasty, Malik Ashraf, wanted to retrieve them out of the fortress, he needed 1,000 camels and 400 mules to transport his wealth. The Eagle’s nest, in the fatherland of Mammad Araz Ibrahimov – a Nakhchivani poet – has only two mountain paths leading to the fortress. On the eastern slope its narrow path, on which only two people could climb, was blocked by three walls and on the western side – by eight walls. Each had a height of up to nine meters and was made not of brittle bricks, but of large stones. There was no point in trying to destroy this structure with a ram or medieval cannons. Moreover, watchtowers, and signal stations where built on the roads leading to the citadel, and on the slopes, there were small shelters for two to three arches at a distance of 20-25 feet from one another. In general, in Alinja – Gala, every inch of land could be taken only at the cost of the invaders’ lives. It is imperative to note that Alinja – Gala fortress is located at the helm of a steep mountain that would immediately bring to a total exhaustion every warrior equipped with an armored uniform, therefore becoming an easy target to the arrows of over 600 defenders of the fortress. Such a historical monument epitomizes the best that Autonomous Republic of Nakhchivan has to offer to international history buffs and to an audience that is eager to appreciate early medieval cultural monuments that are meticulously restored and easily accessible. Alinja – Gala Fortress is a signature piece of restoration led by the provincial government of Nakhchivan and has become one of the top destinations in Europe.